Jason is lured out into an ambush by a dozen armed government agents . Seemingly destroyed, his remains are brought to a hospital for examination. The coroner is possessed by Jason's giant heart and eats it, transferring Jason's essence to him. The coroner begins to cut a bloody swath on his way to Crystal Lake. The creature that holds Jason's spirit has to jump from body to body, and if it can enter a Vorhees, Jason can be born again. Only a bounty hunter and a man falsely accused of murder have any of idea what's happening and not much time to stop it. The opening scene of Jason Goes to Hell is probably the most memorable thing about it. It's too bad the rest of the film couldn't be as a clever. The biggest problem with the entire Friday the 13th series has been that Jason is such a blank slate of a character, scripts are forced to invent new mythology whole cloth nearly every film in later part of the series. As such, the plot here is more interesting than the previous last few entries, but it barely feels like a Friday the 13th movie at all. The film peaks with Jason getting blown to bits and steady tumbles into an endless body hopping chase and a muddled attempt to figure out who is related to Jason Vorhees. Still, it is mindlessly fun and I can't think of a better way to summarize the series as a whole. Fun flick. Really enjoyed this one. This was one of the first "horror" films I watched as a kid, and so it always will have a special place in my heart. The actual first was "Creepshow 2" which sadly, scared me into not watching another horror movie pretty much until i watched "Jason Goes to Hell". 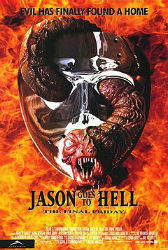 Jason Goes to Hell was the first movie I saw when I got to college. So I have pretty fond memories of it, myself.